Want a designer cot with some serious bang-for-your-buck value for money? Click through to find out what it is. 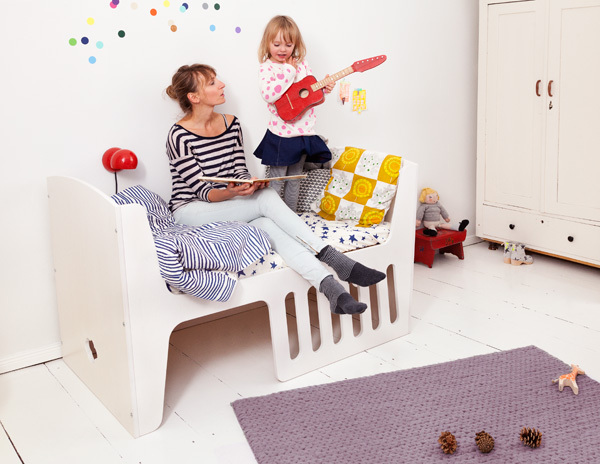 We present to you the Jäll & Tofta Rocky children’s bed! OK, so we can admit that it’s not completely new – we have written previously about the concept, then the launch of the Rocky in the past. But this is a newly modified, safer and slightly more affordable, improved version of the Rocky Children’s bed – so frankly that in itself is worthy of a celebration. The Rocky children’s bed is a fabulously designed, four-in-one piece of furniture that acts as a cradle and parent rocking chair, then can be flipped over to become a child’s bed and the bed rail can be used to add extra security to the sides – just in case they might slip out in those early transition days. For more of an idea at just how versatile the Rocky is, watch the video below, it really is quite amazing to see. I mentioned the new Rocky bed was safer than the previous Jäll & Tofta flagship model and that’s because they’ve added four centimetres to the height of the bedrail and now completely varnished all the components of the furniture for a smoother finish. The new Rocky also comes with a choice of cushion set colours – yellow, grey, green, red or blue and the bed rail is available in either natural, grey or white. 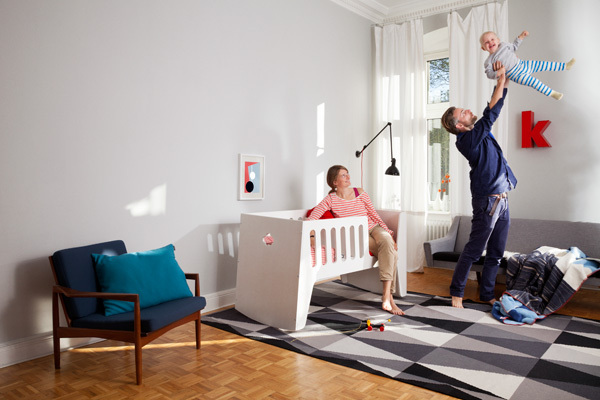 The Rocky Children’s bed is priced €1200 from Jäll & Tofta.